Like every sport, motocross/supercross has evolved greatly since its initial inception. Motocross began in Europe in the 1950s and 1960s, only to come to the U.S. in the middle of the 1960s. Women’s involvement with motorcycle racing coupled with the Women’s Rights Movement are events that supported women’s involvement in the motocross world in the early 1970s. Perhaps the beginning of women’s quest to be involved in the sport was in 1907 when Clara Wagner was the winner of a male endurance competition, only to subsequently be stripped of her title. From then on, several events marked the path to women’s involvement in motocross. In 1916, Adeline and Agusta Van Buren completed a transcontinental motorcycle ride. 1960 was also instrumental as it was a year marked by the first time a woman, Mary McGee, engaged in a road race. And in 1968, twenty women participated in the off-road event, “Hopetown Grand Prix.” In 1971, Kerry Kleid did something instrumental to the world of motocross; she became the first woman to earn a pro motocross license in the U.S. Although her license was rescinded when it was discovered that it had been issued to a woman, it’s still an event that marked women’s involvement in motocross. 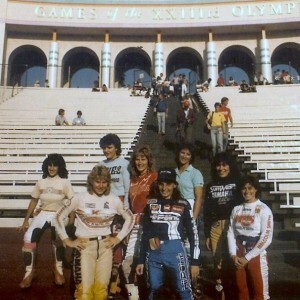 Women’s involvement in motocross began increasing and in 1972, a group of female racers from the U.S. participated in the Canadian CanAm Series, marking women’s first motocross involvement in Canada. In 1974, the monumental Powder Puff National Championship took place. It was women riders’ first chance to compete for a national motocross title in the U.S., and had 300 competitors and nearly 9,000 spectators; the event yielded Nancy Payne as the National Champion that year. In 1975, the Powder Puff National Championship’s name was changed to the Women’s Motocross Nationals. Since the event’s first year, it has taken place annually, except for 2 non-consecutive years in the 1980s. In 1977 Carter Aslop became the first woman to obtain an AMA professional license in road racing. 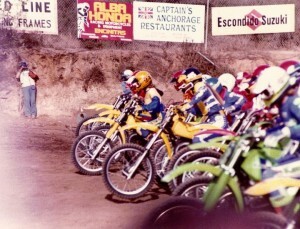 Then in 1978, Sue Fish obtained a men’s professional license and participated in several AMA Nationals. It’s been a rocky road, and due to lack of sponsorship and public interest, the sport has had its ups and downs. Women’s associations, specifically the Women’s Motocross League (WML) and the Women’s Motocross Association (WMA), have formed in more recent years. In 1996, The WML was formed but prior to that, it’s founders we the U.S. Women’s Motocross Team, who was responsible in 1995 for organizing the first AMA Women’s Supercross series. Said organization also successfully petitioned for women to be recognized as professional riders in Motocross competitions. The WML was also responsible for creating the AMA/WML National Championship Motocross Series, which unified Women’s Pro Motocross with the AMA Pro Motocross Championship. 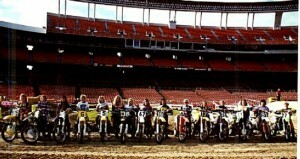 This was yet another milestone for female motocross. Since that WML’s foundation, several important achievements have been made on behalf of women in the world of motocross. The WMA has also been integral to the world of women’s motocross; it was founded in 2004 and sold in 2009 to MX Sports, which meant that the Women’s Motocross Championship would remain a permanent fixture in mainstream Motocross. Another imperative event took place in 2008, when Tarah Gieger became the champion of the first ever Women’s X-games Supercross event. Still a growing sport, women’s motocross has a bright future thanks to all of the women who had and did endure discrimination and pushed to make a reputable sport out of their passion. Gina Williams is a guest post and article writer bringing to us the history of women’s motocross.